A three-stage process for the production of motor fuel (MT) components from lignocellulosic raw materials is described. In the first, pretreatment stage, lignocellulose is subjected to hydrolysis with cellulases followed by fermentation of the resulting sugars into ethanol; then, dilute ethanol solutions are concentrated by membrane vapor separation to obtain 70–80% solutions. 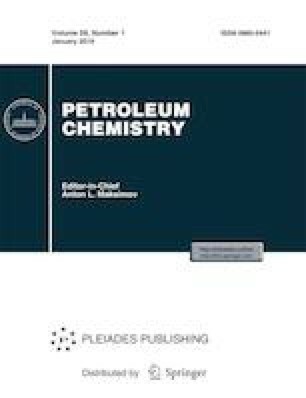 At the third stage, aqueous ethanol solutions (water content 0–50%) in the presence of a Pd–Zn/Al2O3/MFI catalyst at 350°C and a space velocity of 0.6 h−1 are converted into alkanes, and С3–С8 olefins and С6–C12 aromatic compounds (MT components). It has been found that water in an amount of up to 30% in ethanol solutions effectively inhibits the detrimental hydrocarbon cracking and catalyst coking processes, thereby leading to a decrease in the formation of undesirable C1 and C2 products and an increase in the catalyst on-stream time to 100 h wherein the yield of the desired fraction is reduced only by 10–15%. The subsequent treatment of the catalyst surface with steam and hydrogen completely restores its catalytic activity. This work was supported by the Russian Science Foundation, grant no. 16-14-00098. The authors thank RM Nanotech for providing membrane samples.